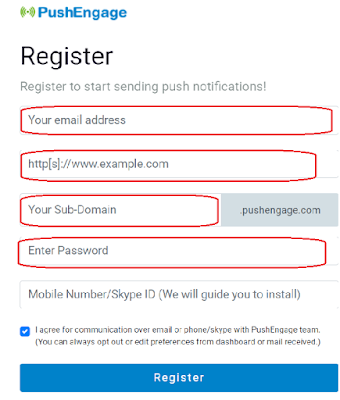 Push notification- Today as tell you how to setup push notification on blog, blogger and website this is very simple method to setup on website you can follow me step by step in this article to see the end. Actually if you want use push notification on website or blog so the notification on website directly if any visitor click to on push button so go to directly notification bowers when are you publish next post that is grow traffic on your website or blog so most important push notification. Today as tell you how to setup notification free of cost. 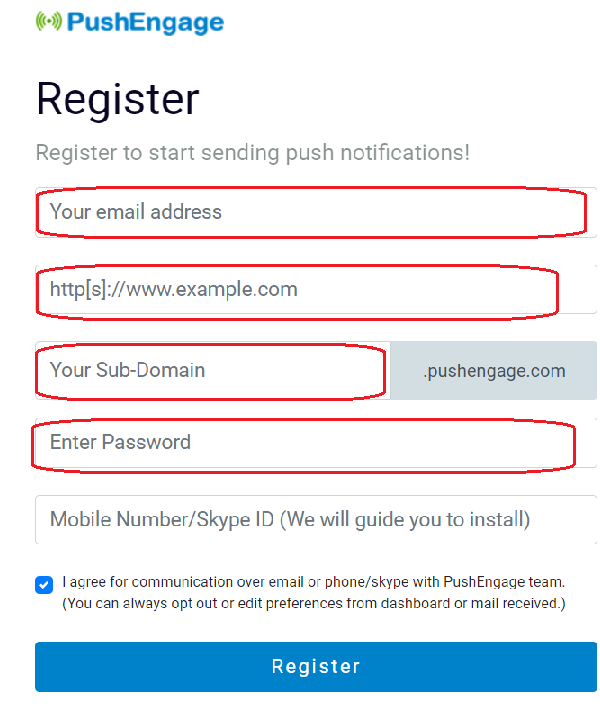 so you go to pushengage website(www.pushengage.com) or click here to Start free trial after fill the all details as per given below picture. After submit register go to setting-installation setting- after you see the choose the website type and script that is http, https, and WordPress now which type your website so you can click here one option and copy the html code and put in blog of themes edit html before the closing </head> after complete the process successfully active you push notification. and also should me verified in your mail. If you want to logo update on blog you can also update featured available in this website. so go to setting and installation setting or click here to site image but must be recommended size set on your logo and upload then save. Subscription dialog box- here(also select http, https and wordpress) check the preview of push notification looking how if you want to edit so that is option available to change simply go to edit option or modified as per required.